From the website: "At Blue Slip Media, we specialize in publicity and marketing services for the trade children’s book industry. "In a business climate where publicity and marketing resources at major publishing houses are stretched thin, we offer expertise in crafting effective press releases, targeted mailing lists, niche and local market outreach, and event planning to create comprehensive campaigns for print and online media. "With over 20 years experience (each!) in the industry, we know the market well and enjoy working in tandem with authors, artists, and publishers to maximize a book’s reach." Could you give us a brief history of Blue Slip Media? Who are the players? Barbara Fisch: Blue Slip Media is still fairly new. Sarah Shealy and I decided to jump into the fray in March 2009, a few months after we left Houghton Mifflin Harcourt. We explain the name on our website, a bit tongue-in-cheek, really, but silliness aside, we have always prided ourselves on our integrity and the belief that good business practices generate good publicity. So the name fit our philosophy (and it doesn't hurt that our initials match as well). What was the inspiration for founding the firm? Sarah Shealy: I've worked my entire career in children's book marketing and publicity. I absolutely adore and value children's and young adult literature. Barb and I job-shared the Associate Director of Publicity position at Harcourt Children's Books for 15 years--it's practically impossible for me to imagine doing any other type of work and doing it solo! When Houghton Mifflin bought Harcourt and decided to close down the San Diego office, we thought about the next stage for us, and it seemed natural and logical to hang up a shingle and continue doing what we love to do--and to continue doing it together. BF: Sarah and I had been through a number of mergers in our time with Harcourt, so we always had the idea of an independent firm in the back of our minds. Our experience mirrors what so many others in publishing are going through today--you must adapt and change and be willing to think creatively. In our case, it meant re-thinking the structure of the workplace and creating a virtual office so we could continue to collaborate as seamlessly as possible. What prior experience did you bring to the job? BF: Like Sarah, the majority of my career has been in children's publishing. I spent several years in subsidiary rights at Harcourt Brace Jovanovich (as it was then known), which was enormously valuable for learning about contracts, basic marketing, and building relationships. The rest of my time with Harcourt was in marketing--first as marketing director, which gave me a good sense of the various communities involved in children's books, and for the next 15 plus years, as part of the job-share publicity team with Sarah. SS: I've always worked in children's marketing. I started at Houghton Mifflin in Boston and then moved to San Diego and HBJ, which changed to Harcourt Brace & Company, and then Harcourt, Inc, and then, for me kind of ironically, Houghton Mifflin Harcourt. Over that 20+ year span I've done just about every job in marketing, from planning to execution--author school visits, conferences, catalogs, promo pieces, displays, curriculum guides, bookstore tours, and, my favorite, publicity campaigns. It's been an amazing experience! Why children's-YA books specifically? What fueled your passion to support books for young readers? SS: I have absolutely adored reading for as long as I can remember. I love the way books feel and smell and can remember checking out Are You My Mother? and Go Dog, Go!, both by P.D. Eastman (Random House, 1960 and 1961), from my school library over and over again when I was in first grade. That love of reading as a child carried me all the way through high school, college, and graduate school. My first "real" job was working as the marketing assistant at Houghton Mifflin Books for Children when I was getting my Masters in English Lit, and I couldn't believe my good fortune. Here was an opportunity to tell the world about fantastic books for children and young adults. What could be more important than putting exceptional books into children's and teens' hands? I think that developing a love for reading early on makes for smarter, more well-rounded, and articulate decision-making adults. BF: People in children's books are much nicer, besides. Do you work with publishers, authors, illustrators, etc.? What kinds of services do you provide to them? BF: Yes, all of them! We've been working on everything, from full campaigns to niche or regional publicity outreach, to writing press releases and tour scheduling. SS: We're also enjoying targeting the educational media market with books that really lend themselves to classroom use. Why is there a need for such services? Has the need grown over time? SS: When we were at Harcourt there was always so much more that we wanted to do for a book than we had time for. We'd be responsible for 30-40 books per season, and as much as we tried to do it all, we always felt like there were more avenues to pursue. We're hopeful that Blue Slip Media can help fill those gaps that publicists at publishing houses just can't get to--like niche outreach to groups uniquely interested in a book's subject matter, be it baseball, fantasy, pirate aficionados, or whatever. Authors today are very savvy and really want full outreach for their books--often more than the publisher can provide with limited personnel and resources. Because we've been house publicists, we're very comfortable collaborating with them and sympathetic to their heavy work loads. We can also help interpret publishing house marketing speak for authors who might be newer to the business and help them to determine if they really need to hire us or if their publisher is pulling out all the stops for their book. BF: As traditional review outlets continue to change and contract--newspapers and magazines have less space than ever devoted to books--niche-interest areas have steadily grown. Finding these niche areas is hugely time-consuming, and it's rather daunting for many authors to tackle alone. Also, and this goes with Sarah's earlier point, an independent publicist can give focused attention to a book. We're not under the same pressure as in-house publicists to consolidate mailings or spend the bulk of our time on a small group of lead titles. Could you give us some idea of rates and/or fee structure? SS: We like to quote on a project basis, so it's hard to give an idea of rates without knowing what the author or publisher is looking for. But I do think it's safe to say that we can work with just about any budget. The best advice is to contact us to discuss your particular goals. Could you highlight a couple of the children's/YA authors and titles that you've worked with? BF: We worked with Jacqueline Kelly on her debut novel The Evolution of Calpurnia Tate (Holt, 2009); Jillian Cantor, author of The September Sisters (HarperTeen, 2009); and Jenny Meyerhoff and her picture book, Third Grade Baby, illustrated by Jill Weber (FSG, 2008). SS: We're also looking forward to upcoming projects with Anne Rockwell and Bobbi Katz. Could you give us a case study to illustrate your approach? What were the unique challenges, opportunities, how did you respond to them, and what were your results? BF: Jenny Meyerhoff's book is a good example. Third Grade Baby had strong reviews when it was published in fall 2008. Jenny had also done quite a bit on her own--she created a curriculum guide and a website, and even put together a contest where teachers could win some freebies for their classroom. But she wanted to get the word out to more teachers. We put together a campaign to teacher and educational journals where they'd list the free curriculum guide and giveaways in their magazines. Those listings will run in August and September issues and we're expecting a lot of exposure for Jenny's book and a huge jump in traffic to her website. What should a writer or illustrator consider in hiring a publicist to promote his or her work? SS: I think they need to have a clear idea of what it is they're looking for. Do they want more exposure to teachers? Do they want to see coverage of their book in their local media? Are they looking for "buzz" in the online world? Coverage in the national media? All of the above? Once they've determined their goals, they need to look at what they can do to achieve them, what their publisher can do, and think about if they need to go to an outside publicist for help. BF: For many authors and illustrators, the first question that comes to mind is, "How much will it cost?" And that is hugely important, for obvious reasons, but it shouldn't prevent them from asking about smaller or more targeted projects if the fee for a full-blown campaign is too high. SS: If I were an author hiring a publicist, I'd want to know about her/his experience in the industry, what type of feedback/reporting structure I could expect, her/his general "take" on my book and what its publicity potential might be, if they would be talking with my publisher about my book, and how long they believe the campaign would last. BF: As an author, I'd also want to know what questions the publicist has for me. If they don't seem curious about my work or what I can bring to the overall campaign, then I might doubt how effective they might as collaborators. How else can the client make the best possible choice? BF: Like any workplace relationship, authors and their publicists need to have similar communication styles. Authors should feel like they can ask questions and contribute ideas freely, but at the same time be ready to hear a contrary opinion from their publicist. That's an intangible--some people make a connection instantly. How can he/she best help their publicist do a great job? SS: Be sure to talk about any interesting back stories that might help the publicist pitch a unique angle on your book. Publicity campaigns can take on a life of their own, so it's impossible to cover all the bases before a campaign begins. Be prepared to field questions from your publicist well into a campaign and beyond! Keep the lines of communication open throughout the process. BF: It's better to run the risk of over-informing your publicist than the reverse. You may think a small booktalk at your local school or library is inconsequential, but it just may help you and your publicist generate ideas for future events. You may have a talent or skill that can translate to larger groups or a bookstore setting. What advice do you have for writers trying to handle their own publicity? BF: First, be realistic with your goals. Start small, using your network of friends, family, colleagues, and associates to help you spread the word about your book. Make sure to send copies to your local paper and your alumni magazine. You need to build a campaign in the same way you put together any structure, beginning with a strong foundation. Second, be cognizant of any news hooks or anniversaries that might make your book timely. Is the book based on a true story? Is there a major movie being released with similar types of events or characters, indicating a possible trend? Does the book lend itself to seasonal themes or holidays? This might be the edge you need to get the attention of the media. Third, use technology if it's comfortable for you. Aside from websites, which are extremely important, I recommend you only use blogs, Twitter, Facebook, and other social media if you can keep it current. Fourth, be patient. Children's books, in general, tend to have a slower build than adult titles; it's not uncommon to see reviews a few months after publication. Finally, be willing to roll up your sleeves. Make time to go out and meet your local bookseller and librarian, attend conferences, and make connections. Think of yourself as a valuable resource for your publisher; let them know you're ready to help and show initiative in providing ideas. If your publisher is willing to send books on your behalf, develop mailing lists for them, with complete names and addresses. What noteworthy changes in children's book promotion have you seen over the years? What are your predictions for the future? SS: Marketing dollars are shrinking, so there's been a huge movement away from printed pieces (posters, bookmarks, etc) to downloadables and other web-based pieces that can live forever online. Technology is opening up ever more promotional opportunities so I think we'll see more and more innovative campaigns with an online component, like Scholastic's The 39 Clues. BF: Even though there's been a move to online publicity and promotion, I do think that connecting with one's audience will still be an important way to promote children's books. Bookstores are still open to author events, though sometimes they're group events (such as a gathering of local authors) or themed events (teen novelists), rather than a single author. Judging by their success, I don't foresee these kinds of things going away soon. As long as we're talking about books, are there any new titles you'd like to highlight? BF: We're working with Houghton Mifflin Harcourt on a series of books about ghost-hunting teens--The Ghost Huntress series--with a nonfiction companion book due out in September titled The Other Side: A Teen's Guide to Ghost Hunting and the Paranormal. Marley Gibson, the author, has teamed up with two experts in the field of paranormal research, Patrick Burns, the star of TruTV's "Haunting Evidence," and Dave Schrader, host of KTLK FM's "Darkness Radio." It's a fascinating project. SS: We're also working on a series for tweens called Gifted by Marilyn Kaye (Kingfisher, 2009). It's lots of fun. 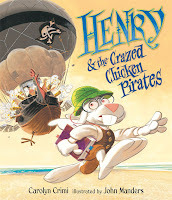 And a new book by Carolyn Crimi called Henry & the Crazed Chicken Pirates (Candlewick, 2009) that allows me to tap into my pet media hook for publicity: Talk Like a Pirate Day (Sept 19!). As for my personal reading, I love YA fiction and am halfway through Suzanne Collins' new book Catching Fire (Scholastic, 2009). I am so completely consumed by the story that I have to force myself to put it down and go to work! I adore Kristin Cashore's Graceling (Harcourt, 2007) and think her new book, Fire (Dial, 2009), is even more amazing. How can prospective clients get in touch? BF & SS: E-mail us both simultaneously at barbara@blueslipmedia.com and sarah@blueslipmedia.com or give us a call at 619.938.3193.